Digital marketing for hotels and the hospitality industry, in general, isn't easy. Constantly increasing competition, not just from new hotels, but also from online travel agencies (OTAs) provides challenges to hotel marketers who are striving for more direct bookings in 2018. In January 2018, Mark Zuckerberg publicly stated that in an attempt to reduce commercial content from invading news feeds, Facebook users will now see much less of this content with a focus on posts by friends and families instead. With this in mind, hotels need to re-think their posting strategies on platforms such as Facebook and Instagram. With less people likely to see the content posted, daily posts on platforms such as Facebook and Instagram are not required. Instead, hotel marketers should consider creating higher quality content coupled with content that can be sponsored for greater commercial impact and demonstrable return on investment from your target audiences. The allocation of marketing budget for hotels is an ever-changing animal. Over the last decade, (most) hotels have made large shifts in budget from offline channels such as print and radio to more measurable online marketing channels. However, the vast number of digital marketing options available now to marketers, presents a new challenge. The challenge today for most marketers is budget dilution across the digital channels, which unless your hotel has huge limitless budgets, is a real problem. Budget dilution can occur when a marketer attempts to use small amounts of budget across a wide number of channels rather than higher, more impactful budgets across carefully selected channels. With more and more digital marketing channels becoming available, marketers will need to be extremely disciplined with how they allocate budget moving forward. Unless larger budgets can be allocated to hotels, marketers also need to carefully consider building owned assets such as customer email databases or blogs that can generate a large and loyal following for them. There's a common mis-conception from many marketers that email marketing is an ineffective marketing tool but the reality is very different. For many years, email has been an often over-used marketing channel that has been abused by many (bad) marketers who have using spamming techniques to mass market. A consequence of this is that email open rates are declining and continue to decline. But that doesn't mean that emails still can't be used in an efficient and effective way by hotel marketers. After all, we all rely on email as a way of communicating in both our business and personal lives. The time spent within our inboxes is increasing and certainly not decreasing. It's therefore important that marketing emails are professionally written, designed and broadcasted with highly relevant content to each individual recipient. Today, email recipients only want to receive emails that are relevant to them and their needs and expect businesses to be able to understand the difference between content that genuinely has meaning to that individual and content that does not. 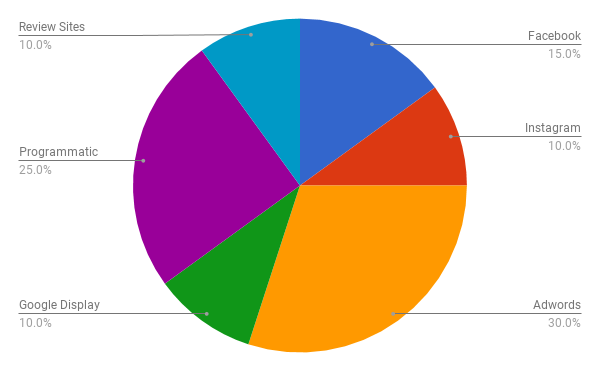 Hotels, therefore need to make a better effort to (a) understand the needs of their customers and (b) be able to categorise this and build and segment this data so that it is usable for marketing purposes. We recently worked with a well-known 5-star hotel brand in Dubai to help them make better sense of their data and by doing so get a much better understanding of their guests and their needs. This involved the implementation of a CRM and tracking system that linked all digital touch-points for guests including the website, email marketing, social media and requests that helped to define their every need. The immediate impact of this was streamlined online marketing effort, increased volumes of customer data collected and the ability to draw a straight line between marketing activity and direct revenue generated from this activity. Every hotel we speak to share a desire to decrease their reliance on online travel agencies (OTAs) and increase direct bookings. After all, direct bookings mean more revenue for the hotels. The challenge for most hotels is that they don't tend to have the resources, budgets or online marketing expertise that the OTAs have at their disposal, which is why the likes of Booking.com and Expedia continue to grow revenues at the expense of hotels forced to pay a commission to ensure that their rooms are occupied. 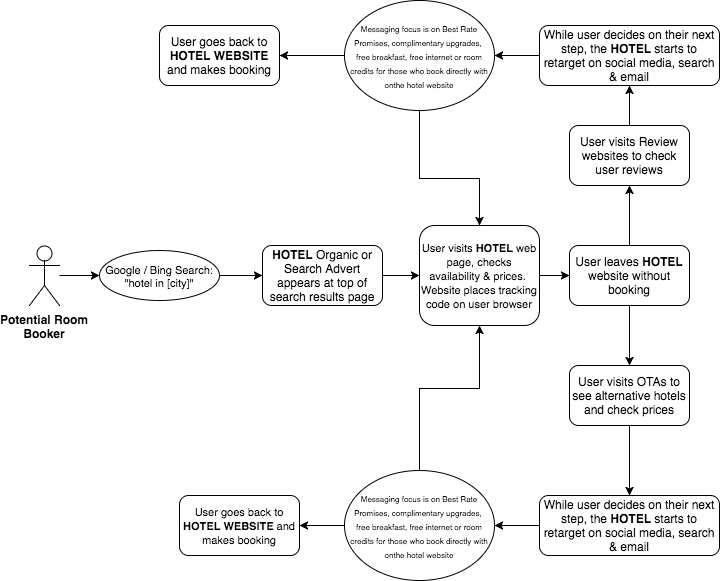 Image 4 above, shows how a guest's search and booking intent ties into marketing opportunities that include email, social media and search. But there's still one major advantage that the OTAs have over hotels, especially if that guest has never stayed at the shortlisted hotel before. The way that OTA's track the behaviour of those in their database takes advantage of the latest technology and provides real insights into how the average traveller books hotels. 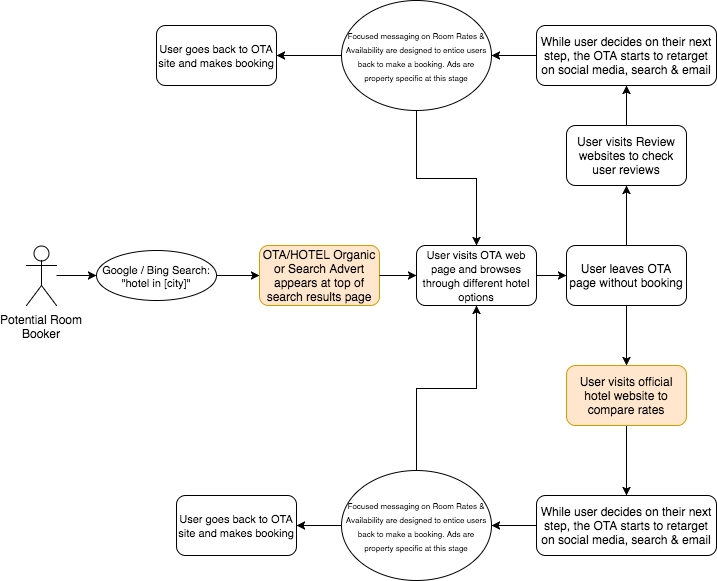 For example, if a user already exists on the OTAs database (along with hundreds or millions of other travellers), it is very likely that every action including website visits, searches (locations and dates), email (opens and clicks) are tracked in a consolidated and sophisticated CRM tool. In addition, other touch-points such as mobile site or mobile application visits, telephone calls and even SMS interactions will all be tracked in the same tool. This data is then analysed and manipulated so that timely messages to each guest can be communicated to drive revenue. This is a significant advantage for OTAs as most (not all) hotels do not have access to this type of information. Therefore, even if a user is searching for a hotel within a city for the very first time, if they land on the OTAs website (and are a part of the OTA's customer database), this user can be tracked and communicated to in a highly personalised way via app messaging, email and social media - even if they did not complete the booking or add any personal contact data during the process. Hotels generally don't have databases of this size and magnitude, let alone the tracking capabilities to automate this type of mass, yet-personalised, communication. What do hotels need to do to keep up with OTAs? There are 2 things and none of these should break the bank! The first is to license a marketing automation platform that allows the hotel to start tracking and behaving like an OTA when targeting guest bookings. Example platforms used by our clients are HubSpot or IBM's Watson Marketing platform. The second is to invest in data collection opportunities. OTAs have the advantage of owning large databases purely from previous guest booking activity but hotels need to work harder. Unless your hotel is a part of a large international group of properties, it's unlikely that you have a database that will help you attract new guests. That's where tip number 5 becomes important. We're sure you'll agree, it's getting boring how often we hear the term "content is king" but surprisingly, this is still ignored by most hotels that we speak to. And we think we now know why hotels still don't seem to get it. The reason is that 'content' as a term is far too broad to make meaningful sense of. Today, we refer to content as website text, images, videos, Facebook posts, Instagram images, stories and more but content needs to be classified and understood better so that hotels and other business can place importance on the type of content that will be most effective for them. 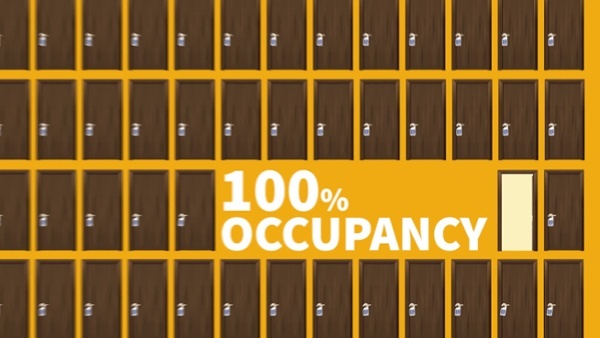 The majority of hotel websites do not offer a visitor any more than the above. So aside from making a booking, what value does a hotel website offer to guests (assuming that the guest has no interest in subscribing to a newsletter (that will probably never arrive anyway)? The answer is none. For website visitors, this is a genuine 'take it or leave it' offering. And this is a significant miss. A hotel in 2018 should be looking to build a relationship with every visitor to their website. Every visitor. Here's why. As images 2, 3 and 4 show, most users will not make a booking the very first time they visit a website. This includes both hotel websites and OTA websites. Today's guest is empowered and has access to vast amounts of information and the majority of guests will search for more information (e.g review sites) before making a commitment. The current hotel website scenario basically ignores guest that isn't prepared to make a booking on their very first visit. Hotels need to change the 'take it or leave it' offering that is currently in place and this can be achieved by offering greater value to website visitors with the use of new and engaging content. For example, if a potential guest visits your website for the very first time, has searched for availability but not yet made a booking, the hotel could offer that guest something of value instead. For example, a free City Guide or Tourist Guide would help the guest plan their trip better. Many tourists would be happy to either receive or download a guide especially during the early stage of planning. Many would be happy to exchange just an email address for this. Once a hotel has an email address, many opportunities open up. For example, personalised communication can now be sent to the guest with information relating to direct booking, offers or even general information that will help to strengthen the relationship between the guest and a hotel. In addition, the email address can be used to market directly to the guest using platforms such as Social Media and Gmail via list marketing opportunities. Hotels can be highly creative once they start communicating with individual guests in a highly personalised manner and by using this data with a marketing automation tool such as HubSpot or IBM Watson's Automation platform, your tracking and analysis efforts will help to unlock revenue opportunities that would otherwise go elsewhere. 6 - Nature v Nurture? In the world of digital marketing, nurture always wins! The nature v nurture debate is a long standing one and "is the scientific, cultural, and philosophical debate about whether human culture, behaviour, and personality are caused primarily by nature or nurture". Depending on your own personal beliefs, nature is widely seen as the winner. In the digital marketing world though, we can use technology to manipulate actions and decisions using nurturing workflows. It's fair to say that at one point or another, we've all been 'nurtured' online. This could include, automated follow-up emails to enquiries that may have been submitted, retargeting messages (or banners) or any other branded response to an initial action by a user such as a website visit. While many e-commerce companies use nurturing to great effect (eg Amazon), in the travel and hospitality business, the only companies taking advantage of this seem to be the OTAs - but even they don't seem to have mastered the art of customer nurturing. So, what can hotels do better? Before we start, it's important to define exactly what nurturing would mean to a hotel and potential guest. In our minds, nurturing is the process that allows a hotel to maintain communication with a potential customer (hotel guest) during the exact stages from initial enquiry/search to final room booking. We've already identified above that there are numerous stages of the booking process typically undertaken by a guest before making a room booking. But what does a hotel typically do to influence a decision during this process? The reality is that most hotels don't tend to do too much. 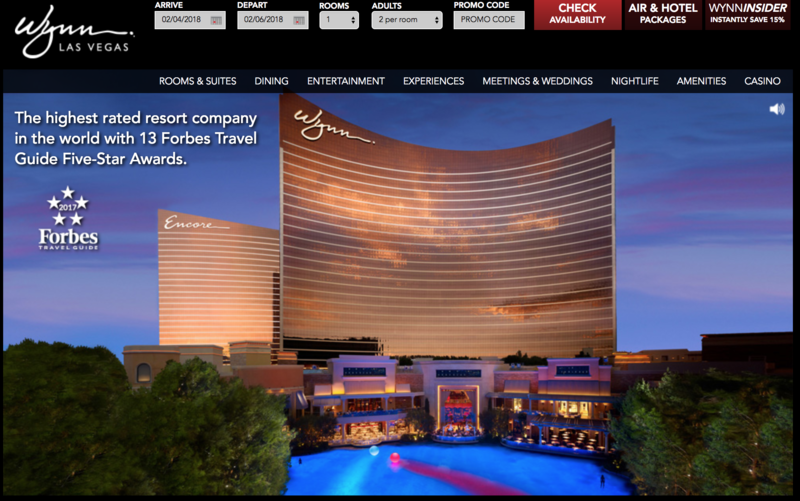 One hotel that does engage in an aggressive nurturing program is the Wynn in Las Vegas who have two properties attached to the same website (Wynn and Encore). The website is simple in that it allows users to search for availability and prices, while highlighting the benefits of a user joining the Wynn Insider program, which is a members only section of the website, where users can obtain additional promotions and offers. For many guests, room price is always a strong influencing factor when selecting a hotel room and the Wynn Insider program highlights this with clear and intelligent copy ("Instantly save 15% off"). Enrollment to the Insider program is very simple and can be completed with ease. In case the user still isn't convinced that they should sign up, there's an instant reminder of the price differential and savings on offer. I expect that conversion from this page will be extremely high. As the hotel knows the target travel dates, they can launch and implement campaigns that relate specifically to those dates. They can also increase the value-adds or promotions the closer the guest gets to the travel date in a bid to close the guest. This approach is fully automated and is built on simple rules or workflows using a marketing automation tool. Other opportunities such as SMS and Mobile Push messaging can also be integrated into these types of campaigns. Trigger based activity can also be embedded into the nurturing plan. This can include automated emails or other communication that can be triggered if the guest returns to your website (either before or after booking) to create new sales and up-selling opportunities. How difficult is it to set something like this up? As mentioned previously, the actual process of creating a strong nurturing program isn't difficult. But it does require investment in technology and an internal determination and culture that supports such an initiative. The beauty of this though is that return on investment is clearly trackable and creates assets in the form of customer data and insights on booking behaviours and insights. The first part of this is technology and tech investments can be made from just US$ 10,000 per year, which will equip your hotel with the tools you need. If you're not sure of the value of this for your business, ask yourself how much your hotel is paying out in OTA commissions and the savings if there was just a 1% shift in guest bookings directly with your hotel. The second part of this doesn't have a fixed dollar cost amount but will require key members of your hotel to educate themselves about the benefits of setting up a nurturing program to increase customer loyalty and revenue. The rise in popularity of Programmatic Advertising channels over the last 3 years has provided hotels with new customer targeting opportunities. Many large hotels and hotel groups have used this to great effect but there are many hotels who are yet to explore the benefits of this. In 2018, there should be some effort placed by hotels to test contextual programmatic advertising to reach potential guests. What is contextual programmatic advertising? Contextual advertising is very much what it sounds like in that it looks at the context of what users are viewing on web pages (such as topics, keywords and other content) and matches advertising that is related to that content. Using programmatic purchasing, much of this can be executed in real-time and on-demand by tapping into large advertising networks that have huge advertising banner inventories across the globe. In addition to the on-page contextual opportunities, programmatic advertising can tap into other data sources, and user browsing history to match adverts more precisely. Other data sources can include information about weather, address or location data, wealth or income and a vast array of user interests. For example, if a Dubai hotel is looking to entice guests from the UK, showing adverts when the weather is cold and wet in the UK to frequent travellers who have the type of income or wealth levels to afford such a holiday and who live within 1 hour of an international airport could be a sensible target audience to attract for a long weekend away. There's a common theme with many of the points above - data. We all live in the information age and a consequence of this is that we have accessibility to more information and data than ever before. Both consumers and as business people. It's therefore, hugely important that hoteliers recognise this and start to market their hotels in a modern, data-driven manner. Unfortunately, many hotels are still marketing their businesses in the same way as they did 10 or 15 years ago but times (and opportunities) have moved on. It's therefore likely that many of the hotels within your competitive set are still using more traditional marketing strategies, which could present better opportunities at a lower cost to you your hotel and in doing so a distinct advantage over your competition! As technology evolves, the line between the offline and online worlds is getting both blurrier and smaller and it's becoming more important that hotels recognise this. Guests today spend an enormous amount of time in the online In the offline world, hotels truly understand that art of hospitality in terms of how to greet guests and make them feel special. In an ideal world, this should be replicated in the online world and therefore, must be the goal for any hotel with true digital ambitions. Guests today, have higher expectations from the brands they interact with, than ever before and it's vital that hotel consider this when planning communication strategies in the digital world. The days of sending un-personalised "Dear Guest" type emails are over. Not only do guests want to be recognised and addressed to correctly, but they also want the content they receive to be relevant to them, their needs and desires from your brand. But note, this isn't limited to just email communication. It's important that a degree of personalisation is considered for all hotel to customer touch-points. To get started, hotels therefore need to understand all interaction points and map these with customer data. Unfortunately, many hotels collect very little data about each customer, so this may prove restrictive. That said, if a hotel's CRM system allows data inputs from restaurants, spa and reservations teams where specific guest requests, spend information and other interesting facts to be stored, will present many marketing and communication opportunities for them. Depending on who you talk to, we're either seeing the fast rise or decline of influencer marketing and that clearly presents a challenge for hotels when trying to determine whether influencer marketing will increase the profile and awareness of their hotel and the link from this to increased sales and revenue. Every algorithm-update by social media companies such as Facebook brings out new theories in terms of how influencer content will be impacted and it's therefore difficult to predict future influencer marketing trends especially when many influencers have built their entire following on a platform that they don't control the destiny to. But here's what we do know. Influencer marketing can positively impact a brand if the objectives of the business are fully aligned with the execution, storytelling and distribution or reach provided by the influencer. Many brands and influencers talk about the need for content to be genuine, but it can be argued that this is contradictory especially if the content is created on the back of an incentive, whether financial or otherwise. There are other considerations too. The recent media story regarding Dublin's White Moose Hotel and the influencer Elle Darby, created an influencer backlash from not just members of the public but also businesses who's frustrations with influencers became quickly apparent. Many of the hotels that we work with are inundated with influencer proposals and requests and while the volumes of requests are certainly increasing, the phenomenon itself is not new. Many hotels have always had a budget or allocation for complimentary rooms to higher-profile guests. In fact, many marketing, communications or public relations managers within hotels have clearly defined key performance indicators (KPIs) set within their job performance criteria that are linked to the additional exposure that influencers bring for their property. Agree a clear set of deliverables and reporting framework for the activity. Determine performance metrics linked to revenue, where possible. 2018 promises to be an interesting one for hotel marketers. For digitally-savvy marketers, some of the new opportunities available may be easier to implement and easier to justify to line managers and other key decision makers but even if you're not a digital native and more of a traditional marketer, it's important that hotels adapt quickly to the changing environment around them. As a hotel GM told me recently, the OTAs only became as powerful as they are today, because they understood the internet and digital marketing opportunities much better than the hotels did. The consequence being the creation of large competitors that they are forced to work closely with in order to survive. It's time for hotels to stand up again, to innovate and take the game to the OTAs. Since 2005, Nexa has worked with independent hotels and large groups providing an extensive range of digital marketing products, services and expertise. Our work includes website creation, management and optimisation, email and social media solutions, performance management, campaigns management and overall digital marketing strategy creation and implementation. Clients include Hilton Worldwide, Oberoi Hotels & Resorts, Viceroy Hotels & Resorts, One & Only Hotels and Resorts, Jumeirah Group, Premier Inn and Wyndham. For more information on how we can help your hotel achieve more with digital marketing opportunities and grow direct revenue, please complete the form on this page.